A very moist banana coffee cake made with a baking mix. This coffee cake with pecans is loaded with pecans and bananas then topped with a delicious streusel topping. I am always so very pleasantly surprised when I make a cake with a baking mix and it turns out as good as a homemade cake. It served me very well to use the ripe bananas I had to make this moist, delicious banana coffee cake. For this coffee cake with pecans, there are pecans in the cake batter as well as in the streusel topping. There are also mashed bananas as well as sliced bananas in the batter to give you lots of flavor. Remember to use bananas that are very very ripe. Like… “turned black and should have been thrown out last week ripe” to take advantage of the full flavor of your bananas. The riper they are, the more banana flavor they’ll put into the cake. This delicious cake has mashed bananas as well as sliced bananas in the batter to give it lots of yes…Banana Flavor! We start the recipe by preheating the oven to 350 degrees and greasing a 13×9 in baking pan (set it aside). Place the following ingredients into a large bowl. You don’t even have to get your mixer out to make the batter, a whisk will work just fine. Whisk the ingredients together until they are well combined. Using a wooden spoon, stir in the baking mix and 3/4 cup chopped pecans. Fold the banana slices into the batter, pour the batter into your prepared pan. Place the following ingredients into a medium bowl. Cut the butter into the baking mix with a pastry blender, add 1/2 cup chopped pecans. Stir to incorporate the nuts. Sprinkle the topping over the cake batter evenly and bake for 35 to 40 minutes. Banana Pecan Coffee Cake is a very moist cake and super easy to make, your whole family will love it, ENJOY! Banana Pecan Coffee Cake - a very moist coffee cake made with a baking mix. This cake is loaded with pecans and bananas then topped with a delicious streusel topping. Whisk together the mashed bananas, sugar, milk,oil, cinnamon and eggs in a large bowl. Make sure everything is incorporated well. Using a wooden spoon stir in the 2 2/3 cup baking mix and 3/4 cup chopped pecans. Fold the banana slices into the batter, pour the batter into the prepared pan. Place the baking mix, brown sugar and cold butter into a medium bowl. Cut the butter into the baking mix with a pastry blender, add 1/2 cup chopped pecans. Stir to incorporate the nuts. Sprinkle the streusel over the cake batter evenly. Bake 35 - 40 minutes or until tests done with a toothpick. I absolutely love your recipes! Delicious cakes, etc., with very little effort. Never miss any of your postings! Thank you so much. Thank you Karoline! I love what I do and so appreciate you taking the time to visit and comment. Thank you! Nothing says good morning better than a warm piece of banana cake. Love the addition of the streusel topping. Yum! I love the combination of bananas and pecans in this coffee cake. So flavorful! I love all coffee cake, but these flavors are especially delicious! Great recipe! I’ve fallen in love with Pecans only recently, so I’m thrilled to see it here combined with bananas into a moist coffee cake. BTW your cake looks gorgeous and would make a great center piece on our coffee table. Such great flavors used in this cake! Looks so tasty! 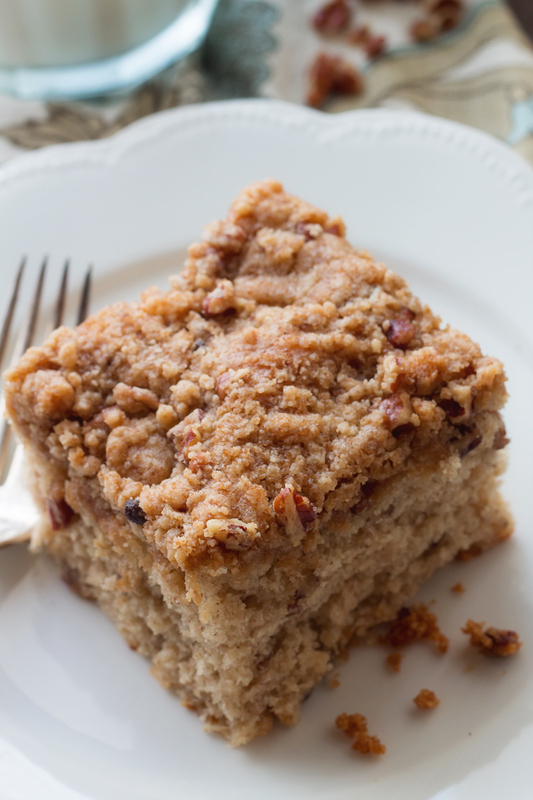 I love a good coffee cake and with the banana and pecan flavors – this sounds amazing! Banana and Pecans are such a great combo! And that crumble? Oh my! I made this using gluten free Bisquick and it was a total hit with all family members. Tasted sooo good and my gluten free family members were in 7th Heaven. Easy and delicious. Thank you for this Keeper recipe.